Olson Defendorf Custom Homes has been a Pallasart customer for ten years. An earlier website we created for them won Texas Home Builder website of the year from Texas Home Builder Magazine. They have won many awards for their homes and has become the leading home builder in Austin and central Texas. 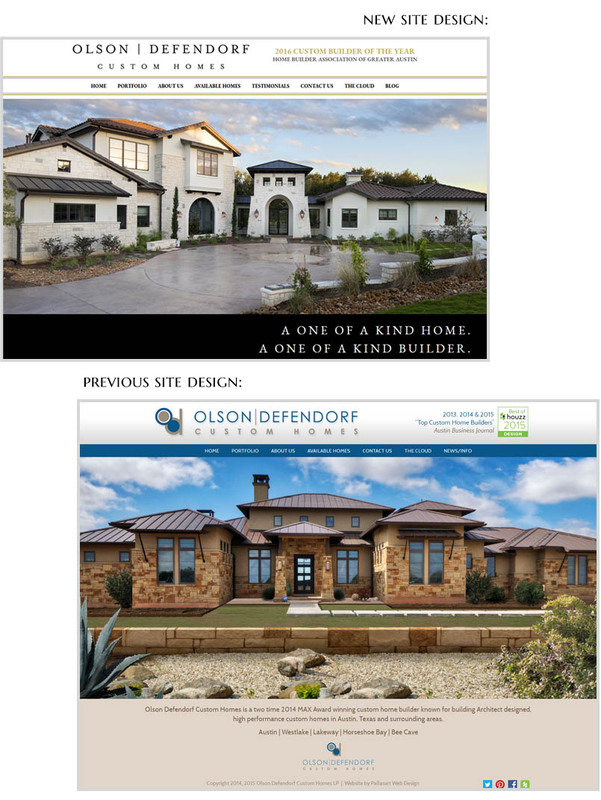 Olsen Defendorf specializes in high-end construction and modern contemporary design. They work with top local architects who understand Austin lifestyles and how to maximize square footage at the best cost. Olsen Defendorf is well-known for its ability to build beautiful homes that combine the latest technologies and materials with sleek fixtures and super finishes. Every home they build is a masterpiece in its own right. Last year the company decided to upgrade and modernize their brand presentation. The redesign was sleek, clean, black & white and ultra contemporary. Olsen Defendorf used to use a non-serfifed font in its logo - in the new design they went serifed, which added some elegance and refinement to the brand. They also used a totally flat design, without any shadows or artificial depth. The stark contrast of white and black makes the colors in the home portfolio and slideshows really pop without any garishness. The gold lines are a nice touch. The home galleries and portfolios all look superb in the new redesign. The entire website was reformatted and designed in the new style guide. We have already been receiving lots of complements on the new website and expect it will succeed in showcasing Olsen Defendorf in a fresh and updated website. We would love to do a similar update to transform your builder website. Call us at 512 469-7454 and we can discuss your project and its objectives.